Sarco/Endoplasmic Reticulum ATPase (SERCA) transports calcium ions into the endoplasmic reticulum (ER), and is important in the regulation of intracellular calcium levels. Inhibitors of SERCA have shown to induce increases in cytosolic calcium levels and depletion in ER, triggering ER stress, unfolded protein response (UPR), and various pathways that can result in cell death. This has lead to the development of SERCA inhibitors for cancer therapies. This review provides an overview of current literatures in these aspects. Sarco/Endoplasmic Reticulum ATPase (SERCA, a calcium pump) uses the energy gained from the hydrolysis of ATP to transport calcium ions against their concentration gradient from the cytosol into endoplasmic reticulum (ER), the main intracellular calcium storage organelle.SERCA is the only protein that transports Ca2+ into the ER and is detected in all ERs. SERCA along with other Ca2+ channels/pumps and tightly regulate cellular Ca2+ homeostasis; becausethe levels of cytosolic free Ca2+ control many cellular processes, including cell proliferation, gene transcription, and cell death. In normal cells resting cytosolic Ca2+ levels are at the nanomolar concentrations, whereas those in the ER lumen are in the micromolar range, and the extracellular Ca2+ levels are typically in the millimolar range. Alterations in thesenormal Ca2+ levels can represent a disease state due to chemical or signal transduction changes in regulation [1,2]. SERCA exists in several isoforms. Alternative splicing of SERCA genes ATP2A1, 2A2, 2A3 gives multiple isoforms . Typically these SERCA isoforms have ~75% sequence homology . Like many other proteins the expression of SERCA isoforms is cell type dependent. SERCA1a and 1b are expressed primarily in skeletal muscle. SERCA2a is mostly expressed in cardiomyocytes. SERCA2b is detected in all cell types. SERCA2c is detected in non-muscle cells. SERCA3 has six known isoforms and is typically co-expressed with SERCA2b in many tissues. However, SERCA3 has a higher expression in cells of hematopoietic origin . These isoforms also have different Ca2+ affinity with SERCA2b having the highest affinity and SERCA3 having the lowest Ca2+ affinity [3,5]. With the SERCA pumping Ca2+ into the ER, ER Ca2+ can be released by inositol-1,4,5-phosphat-receptor (IP3R) and ryanodine receptor (RyR) or by calcium leakage. Ca2+ release from the ER can lead to mitochondrial Ca2+ uptake . Increase in mitochondrial calcium can cause permeablization of the mitochondrial outer membrane (MOMP) by pro-apoptotic Bax and Bakproteins followed by the release of cytochrome C, which activates caspase 9 leading to apoptosis . ER Ca2+ release also causes an increase in cytosolic Ca2+ levels, whichcan activate calcineurin that dephosphorylates/activates bad. Dephosphorylated Bad inhibits anti-apoptotic Bcl-2family proteins, leading to similarouter mitochondrial membrane permeabilization followed by apoptosis . Cytosolic calcium increase also triggers other forms of cell death, including necrosis, necrotic-like-apoptosis (necroptosis), and autophagy. For instance, whenER Ca2+was released in murine embryonic fibroblasts (MEFs), deficient in apoptosis due to the lack of proapoptotic Bak and Bax, cells underwent necrosis . An increase in the cytosolic Ca2+ concentration also stimulatesCa2+/calmodulin-dependent kinase kinase-β (CaMKKβ), which activates AMP-activated kinase (AMPK) that in turn inhibits mTORC1, inducing autophagy . Besides increase of Ca2+ in mitochondria and cytosol, depletion of calcium in the ER also can serve as a direct trigger to programmed cell death. Specifically decrease of calcium in the ER will lead to ER stress response (ERS) and unfolded protein response (UPR).As seen in HeLa cells ER stress canlead to cleavage and activation of pro-caspase 12 by m-calpain, which then activates subsequent caspases resulting in apoptotic cell death [10,11]. Proper ER calcium levels are needed for the function of calreticulin and calnexin, which are involved in protein folding. Depletion of ER Ca2+ stores lead to an increase of misfolded proteins, resulting in ER UPR . UPR activates pathways that decrease protein synthesis, initiate autophagy for salvation, and increase protein degradation and folding . Prolonged activation of these responses leads to apoptosis . Besides direct initiation of programmed cell death, SERCA is also involved in other regulatory pathways controlling cell survival. For instance, SERCA was identified as a key regulatory protein of Notch1 signaling pathway . Given its pivotal role in cellular calcium regulation and cell proliferation/death, SERCA is a potential anticancer target. A number of SERCA inhibitors have been identified with different potency, selectivity and preferred binding states. The most selective and potent inhibitor of SERCA known to date is Thapsigargin (TG) (Figure 1). TG is a sesquiterpene lactone isolated from the plant Thapsia garganica. TG increases the cytosolic calcium concentration while depleting ER calcium stores. It inhibits SERCA in stoichiometric quantities affecting Ca2+ transport and ATPase activity . TG inhibits the Ca2+ free state of SERCA at low nanomolar concentrations forming a dead end complex . TG binds SERCA in its transmembrane helices M3, M5, and M7.Even though SERCA isoforms have a high percentage of homology they have different sensitivities for current SERCA inhibitors. TG potently inhibits SERCA1b with a Ki of 0.21 ± 0.05nM, SERCA2b 1.3 ± 0.05nM and SERCA3a 12 ± 6nM. All analogs of TG have proved to be less potent than the parent compound . Interestingly, cellular treatment with TG leads to a short term (15min) large cytosolic increase in calcium concentration, stimulating apoptosis, followed by a long term (48h) minor cytosolic increase in calcium that initiates proliferation for those that survive the first shock . Other selective but less potent inhibitors of SERCA include Cyclopiazonic Acid (CPA) and 2,5,-di(t-butyl) Hydroquinone (BHQ) (Figure 1). They have different inhibitory potency against SERCA isoforms 1b, 2b and 3a. The Ki of CPA was 90 ± 30nM for SERCA1b, 2.5 ± 0.05μM for SERCA2b and 600 ± 200nM for SERCA3a. The Ki of BHQ was 7 ± 4μM for SERCA1b, 2.6 ± 1.3μM for SERCA2b and 1.7± 1μM for SERCA3a . Site-directed mutation data demonstrate that CPA and BHQ bind to different sites relative to TG on SERCA. The mutation F256V in SERCA reduced the potency of TG inhibition 200 fold for SERCA1b, 5 fold for SERCA2b, and 100 fold for SERCA3a. CPA and BHQ, however, showed little difference in Ki values between the wild type and mutant isoforms . Later studies confirmed that these small molecules have different binding sites on SERCA from that of TG, and such binding stabilizes SERCA in its low Ca2+ affinity state, leading to SERCA inhibition . Curcumin, a natural product from turmeric, has been investigated in clinical trials for its anti-cancer activities towards colorectal cancer (Figure 1) . Curcumin inhibits SERCA with a Ki of 15μM. It binds competitively with ATP and uncompetetively with Ca2+ . 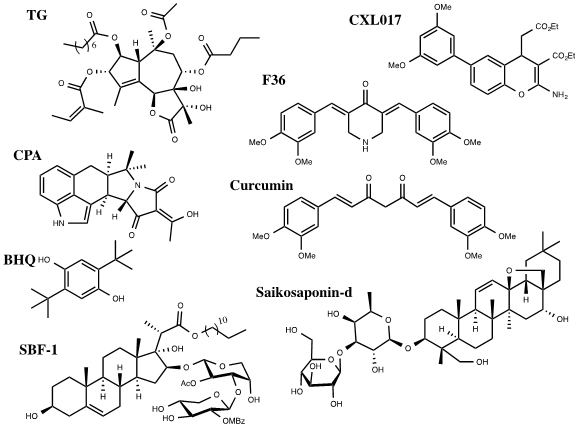 Curcumin has some selectivity among SERCA isoforms. It inhibits SERCA1b (5.8 ± 1.6μM) and 3a (8.6 ± 2.5μM) with similar Ki values but inhibits SERCA 2b with a significantly decreased potency (53 ± 6μM) . F36 is a more active piperdone analog of curcumin and has shown to be more effective at inhibiting the proliferation of colorectal cancer cell lines mainly by targeting SERCA2 expression . Saikosaponin-d (Ssd), a triterpenoidsaponins isolated from Bupleurum falcatum L., has shown to induce autophagy by inhibition of SERCA (Figure 1). This results in an increase of cytosolic calcium levels leading to ER stress and UPR. Interestingly, Ssd showed similar micromolar cytotoxicity in cells deficient in caspase-3/-7/-8 or Bax/Bak proteins,which are typically apoptosis deficient, as in wild type cells. This indicates that the cytotoxicity due to Ssd can circumvent the defect in the apoptotic pathway and could be used in cancers resistant to drugs that target the apoptotic pathway . SBF-1, a steroidal glycoside, was found to cause ER stress and UPR in cervical cancer HeLa cells (Figure 1). It binds and inhibits SERCA2 at nanomolar concentrations. However, SBF-1 also binds to plasma membrane calcium transporting ATPase 1, PMCA1, which may also contribute to its anticancer potential . Our laboratory has identified a stable derivative of HA 14-1 (sHA 14-1) as a dual inhibitor of both Bcl-2 and SERCA proteins. sHA 14-1 induces cell death through ER stress and Ca2+ release . Exploration of the structure activity relationship of sHA 14-1 led to the discovery of ethyl 2-amino-6-(3,5-dimethoxyphenyl)-4-(2-ethoxy-2-oxoethyl)-4H- chromene-3-carboxylate (CXL017) (Figure 1) and its analogues. CXL017 showed preferentially cytotoxicity in multi-drug resistant HL60/MX2 and CCRF-CEM/CT cancer cell lines. CXL017 also showed cytotoxic synergy when combined with standard chemotherapeutics, including vincristine, paclitaxel, and mitoxantrone in treating MDR cells . Interestingly, CXL017 also showed strong synergy with the general SERCA inhibitors TG, BHQ, and CPA in inhibition of SERCA activity and in inducing cellular cytotoxicity . These data support a unique binding site of CXL on SERCA. However, the exact binding site/state of SERCA by CXL017 remains to be determined, which may help rationalize its unique activity profile. Like many proteins, SERCA expression levels are altered in cancers. SERCA3 expression is induced during cell differentiation, but decreased in the tumorigenesis of cancers such as colon and breast . Expression of SERCA3 and 2b isoforms has been found to differ in normal verses cancer cells in myeloid leukemia, colon carcinoma, breast cancer . Expression of SERCA2 was decreased in squamous cell carcinoma, in addition to colon, lung, colorectal, and thyroid cancers [26,27]. Expression of SERCA3 is increased in APL cells, but decreased in colorectal carcinoma, gastric carcinoma, and breast cancer [3,12,28]. This decrease has been suggested to possibly add to the induction of malignancy and provides evidence that Ca2+ regulation is modified in cancer cells to prevent apoptosis [12,29]. Knockout mice, heterozygous for SERCA2, showed increased sensitivity toward the development of squamous-cell carcinomas, indicating that alterations in intracellular Ca2+ regulation can lead to cancer development [26,30]. Even though some SERCA isoforms are generally down-regulated in many cancers, SERCA maystill be apotential target for cancer therapies. SERCA 2b and 3 are often co-expressed in cells and decrease in the expression of one isoform does not necessarily indicate a decrease in both. SERCA 2b and 3 have different turnover rates and Ca2+ affinities, making them active at different levels of cytosolic Ca2+ . The remodeling of Ca2+ regulation in cancer cells is still not well understood, but there has to be enough SERCA to maintain ER Ca2+ levels to sustain protein synthesis. Lastly SERCA inhibitors such as TG have shown to be cytotoxic in these cancer cells with reduced SERCA expression. Cytosolic Ca2+ levels also change in cancer cells, partly due to changes in expression of ER membrane proteins, such as SERCA and IP3R, and Bcl-2 family proteins that regulate calcium homeostasis  IP3R and SERCA are regulated by anti-apoptotic Bcl-2 protein, which is highly expressed in many cancers. Bcl-2 modulation of IP3R has shown to promote proliferation and inhibit autophagy . Bcl-2 has also been implicated in the regulation of SERCA, decreasing the amount of Ca2+ pumped into the ER to also to prevent releases of Ca2+ sufficient to trigger apoptosis . Nevertheless, inhibiting SERCA as a treatment for cancer does not come without risks. Decrease in ER Ca2+ levels leads to heart failure . In addition, since different cell typesand cancers have different expression levels of SERCA isoforms, isoform-specific inhibitors may be necessary to achieve tissue targeted therapies with reduced adverse effects. Based on the different potency of current inhibitors against SERCA isoforms and their varied binding site, it is possible to discover SERCA isoform-selective inhibitors. Bioconjugation is an alternative strategy. For instance, in order to increase selectivity and decrease toxicity, TG has been coupled with a peptide that can be cleaved by PSA, prostate surface antigen, forming TG prodrugs for prostate cancer. PSA is a serine protease that has an increased expression in prostate cancer cells, allowing TG to selectively target prostate cells. Currently these prodrugs are in clinical trials for the treatment of prostate cancer [34,35]. SERCA plays an important role in cellular Ca2+ regulation. SERCA inhibition causes an increase in cytosolic and mitochondria Ca2+ concentration with ER depletion, which can trigger several signaling pathways that may result in cell death. SERCA inhibitors have proven to be effective in causing the cytotoxicity of cancer cells in vitro, but tissue selectivity and cardiovascular risk still needs to be assessed in vivo and clinically. This work was supported by grants from NIH (CA163864, CX). Inesi G, Sagara Y (1994) Specific inhibitors of intracellular Ca2+ transport ATPases. Journal of Membrane Biology 141: 1-6. Li W, Ouyang Z, Zhang Q, Wang L, Shen Y, et al. (2014) SBF-1 exerts strong anticervical cancer effect through inducing endoplasmic reticulum stress-associated cell death via targeting sarco/endoplasmic reticulum Ca2+-ATPase 2. Cell Death Dis 5: e1581. ©2015 Casemore D. This is an open-access article distributed under the terms of the Creative Commons Attribution License, which permits unrestricted use, distribution, and reproduction in any medium, provided the original author and source are credited. Department of Medicinal Chemistry, University of Minnesota, CCRB 2-125, 2231 6th St SE. Minneapolis, MN 55455, USA, Tel: (612) 626-5675.